For more than 50 years the cylindrical shape of large water heaters didn’t change. 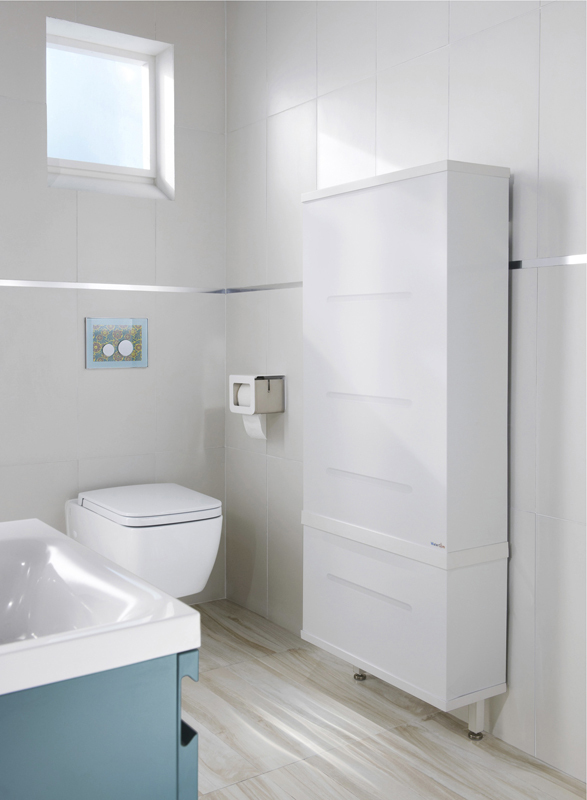 The idea was simple, almost obvious: forget the traditional shapes to save space and obtain a flat water heater that can fit in kitchens and bathrooms. To take an ingenious idea and make it an effective device, the teams from WaterSlim faced a dual challenge. Challenges of design and technology. Behind its revolutionary shape are months of studies, development, testing and certification. The skills required were provided by professionals from a variety of fields, and in particular from Formula 1 racing. With a thickness of only 20 cm, it easily fits in any room of your home. Available in 50 and 100 liters to meet your needs perfectly. 100% stainless steel tank, 7 years warranty for total peace of mind. Reduced heating time and reinforced insulation. With its sleek design and small footprint, it fits perfectly into your home. Available in several colors and material effects for even smoother implementation.